RDR2 Online ultimate edition bonus items are special rewards you’ll get in the online mode if you’ve bought the fancy edition of Red Dead Redemption 2. They include three outfits, a couple of weapons, a dapper black thoroughbred, and bonus ranks. Early birds are already playing the game, and a number of players are wondering where to find ultimate edition bonus items in RDR2 Online. This guide is going to show you how to claim your stuff. How to claim Ultimate Edition bonus items in RDR2 Online? You’ll have to wait until the introduction is over. Once you have a camp, go there and you’ll be able to get the stuff. You can get the survival camp theme items by customizing your camp – each will be at the bottom of its respective list, and will be listed as free. The horse will be available at any stable, or through the book used to buy stuff in the camp. The book will also allow you to claim the weapons and outfits. Press left on the D-pad to bring it up. Look in the weapons section and you’ll get the chance to snag a Pump Action Shotgun and Volcanic Pistol. 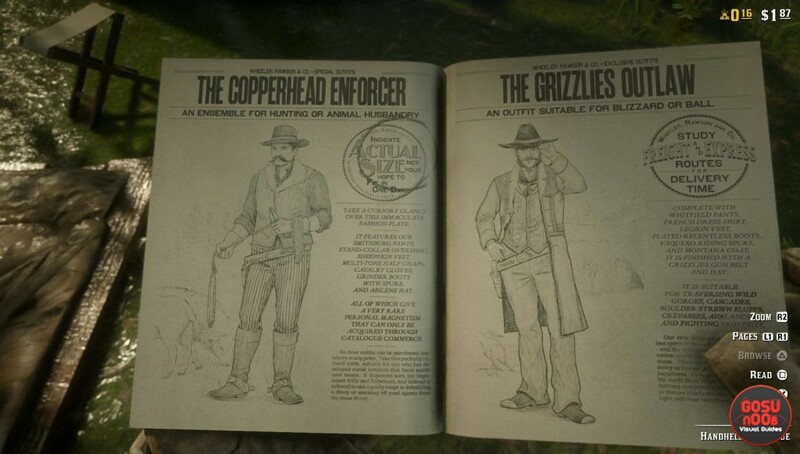 If you browse the outfits, you’ll be able to take a Copperhead Enforcer, Grizzlies Outlaw and Blackrose Bounty Hunter suits. The weapons will be sent to your horse when you get them, while the outfits will go to the wardrobe. The additional ranks you’re entitled to should be added to your total automatically, but they’re not there when you start, which probably means they’ll become available later. How to get Gold Double Action Revolver in RDR2 Online? The Gold Double Action Revolver from the GTA Online challenge is also available. If you’ve completed the challenge, you’ll get the gun automatically, and it’ll appear in your horse inventory as soon as you’re through with the tutorial. Hi I’ve completed the main part and I have my camp but when I go to see the outfits there not there, also the pump shotgun or volcanic pistol aren’t there either so I don’t know what do do I have the ultimate edition and every thing. You have to purchase everything out of the catalog, but it will show the price as $0.